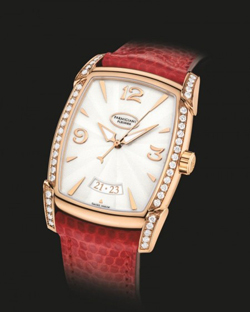 With the delicacy of her curves highlighted by precious materials and Christmas 2012 Parmigiani Fleurier Kalparisma Agenda will rest with comfort and elegance on the pulse of chic woman. Play the representative codes of the Maison is an inexhaustible passion. Parmigiani Fleurier Kalpa and its characteristic form are now more than ever linked: together they tell a story of class and elegance. The creation of Parmigiani Fleurier Kalparisma agenda represents a return to the essence of the form, redesigned to accommodate smaller automatic movement (Calibre PF 331). The loops, the tonneau-shaped, arched profile are the signature recognizable Parmigiani. Kalparisma Agenda shall resume creating the perfect combination of the two pillars of the brand : the mechanical watchmaking and simplicity of form. Kalparisma The collection, available exclusively in 18 carat rose gold, with or without diamonds, combines elegance and sobriety. The numbers on the dial, smaller, have been restated to give the whole a new balance, black or white, sunray guilloche and lacquered, the dial is always elegantly combined with the leather strap Vitello Swift Hermes for the white version and Hermes lizard for one in black. There is also a version in red lizard Hermes for women who love the originality.